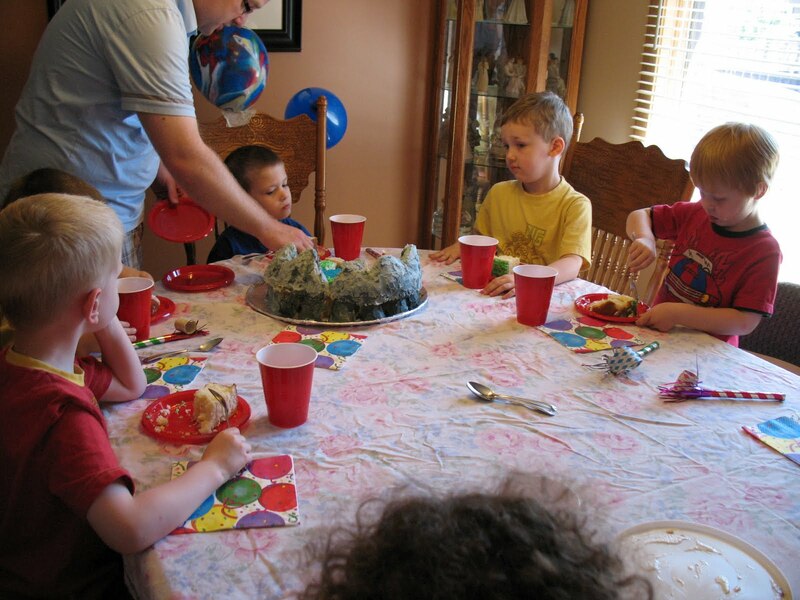 Ok, so skip back in time with me a bit... remember the dragon (Toothless) I made out of fondant? 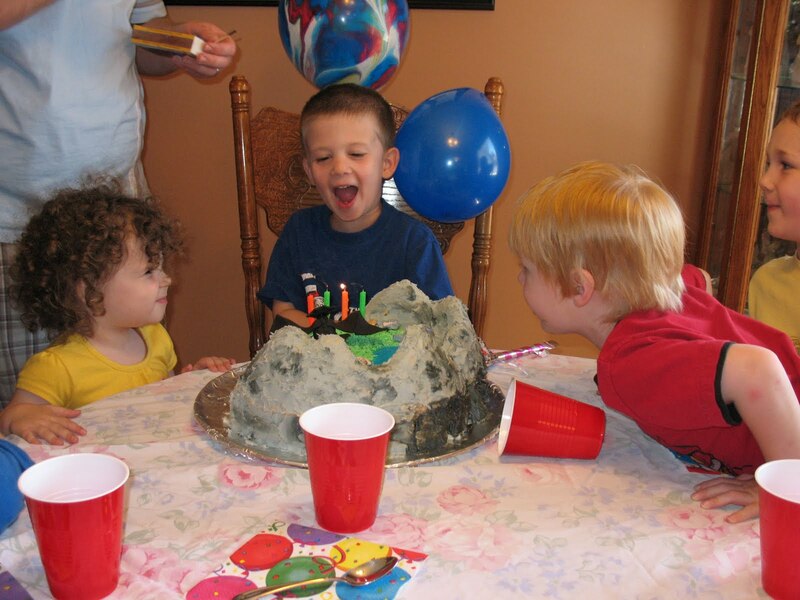 Well, I used him on my son's 4th birthday cake. He LOVES "How to Train Your Dragon" so we had that as the theme for the party. He loved it, so I am going to share my ideas with you -in case anyone else wants to use them for their little dragon-lover. 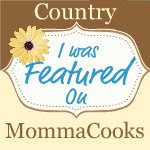 I used a white cake mix (Betty Crocker) and baked two 9-inch round pans. 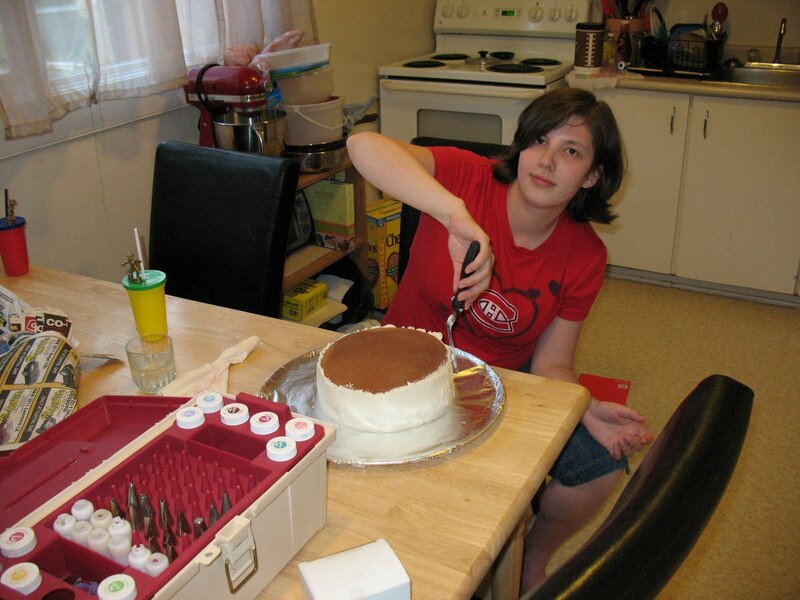 Make sure to grease (I use Crisco) and flour the pans first to make sure the cakes will come out in one piece! 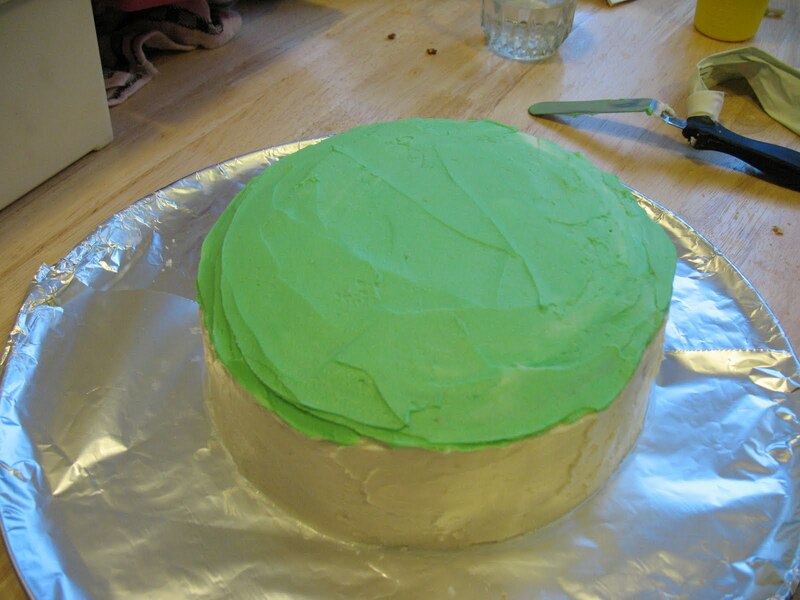 Once your cakes are cooled, trim the tops to level them out. 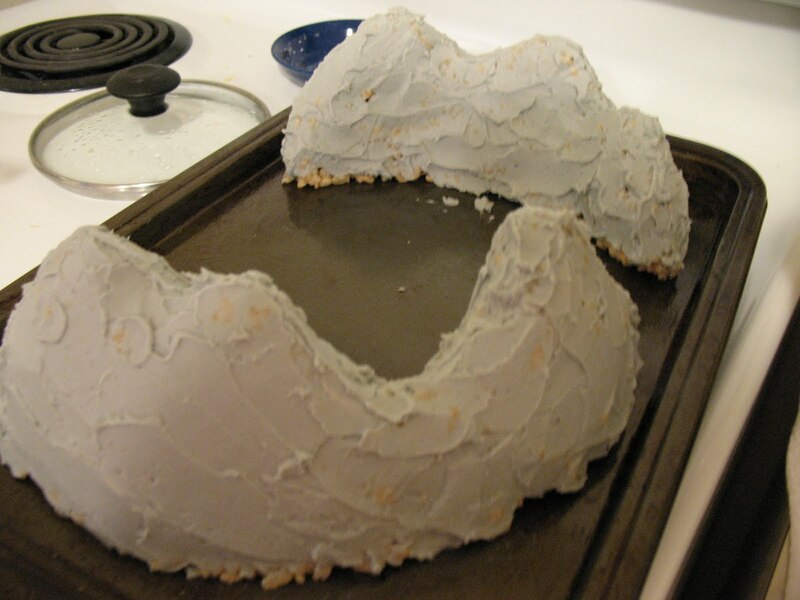 Then put frosting in between and stick them together (trimmed sides together in the middle). I iced the sides of my cake with white buttercream. Ice the top in green. 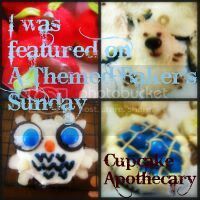 I color my icing with AmeriColors soft gel paste. 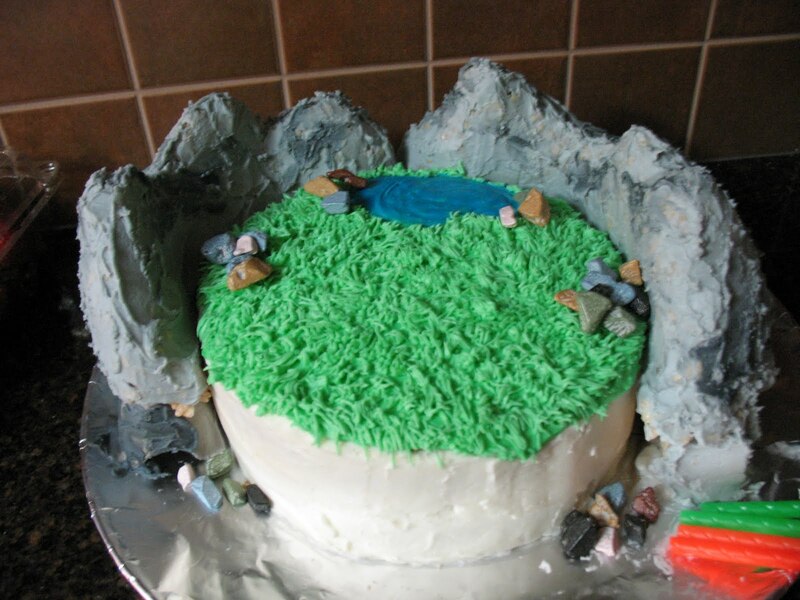 Don't worry about getting it super smooth, as we will add some "grass" later on. 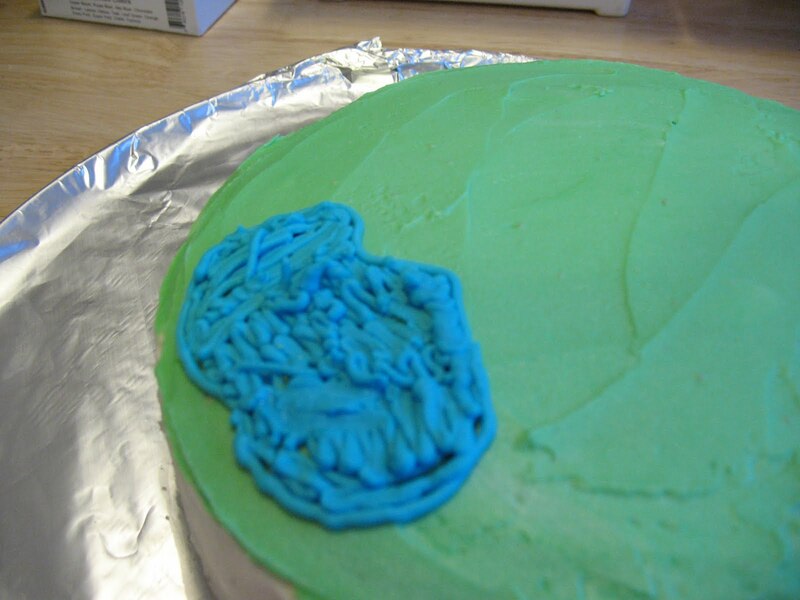 Using a piping tip, pipe in a lake in blue icing -be as messy as you like, I'll show you my trick to smooth it out! First, get a small paintbrush. A small, cheap-o craft one will do -just make sure it has not been used for paint! Then get a glass with some HOT water. 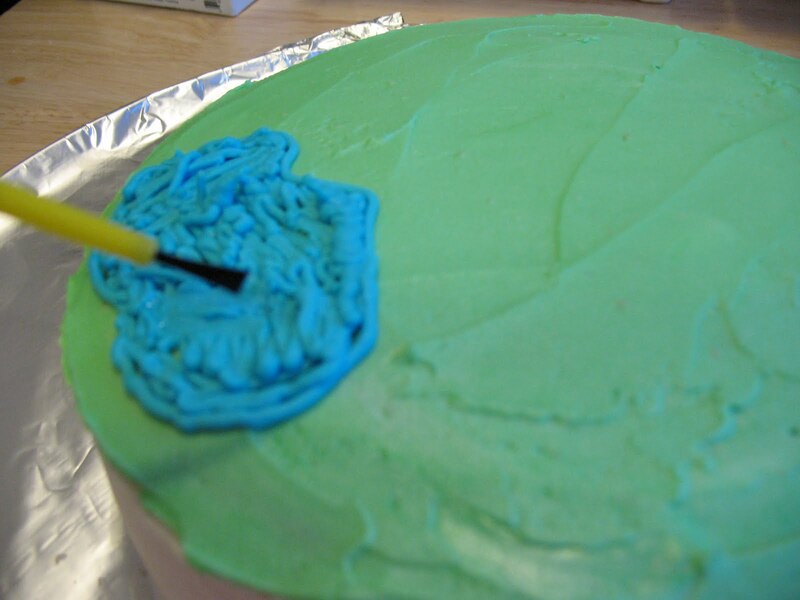 Now just dip the brush in the hot water (shake off excess water) and "paint" the icing to smooth it. 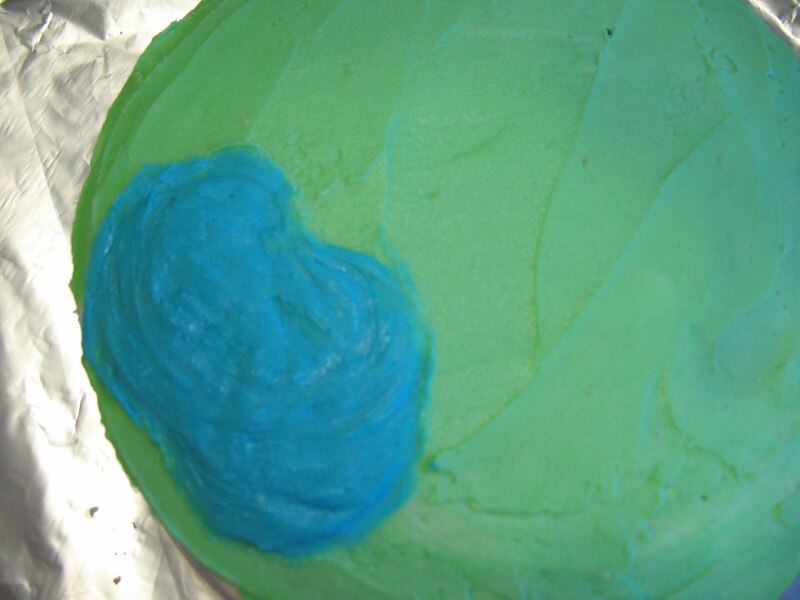 I smoothed the edges too -to make it look more like a shore. 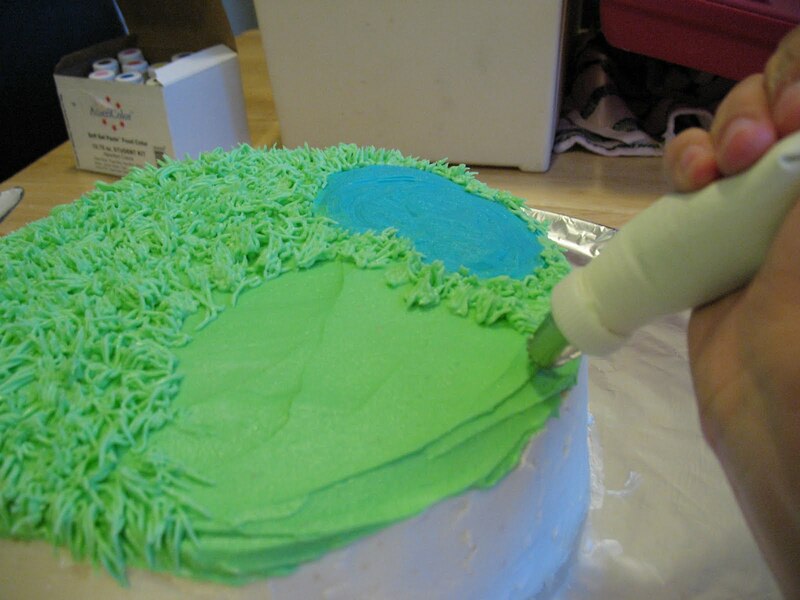 Then use a grass tip to cover the top of the cake in grass. 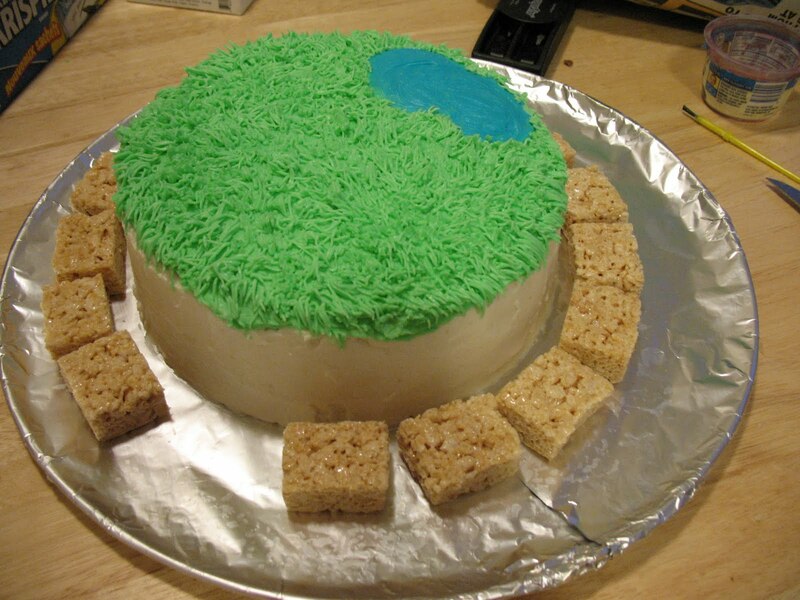 I started at the edges and worked in from there so the "grass" overlaps. 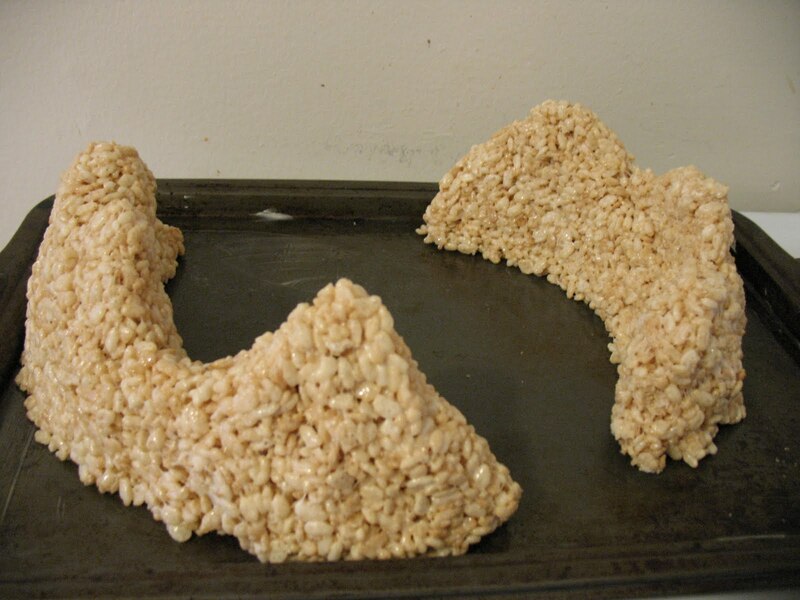 Then I whipped up a batch of Rice Krispie squares... but instead of pressing them into a pan, I sprayed a cookie sheet with Pam and molded them into some mountains to go around the cake (I just let the mixture cool off a bit and used my hands to shape the mountains). 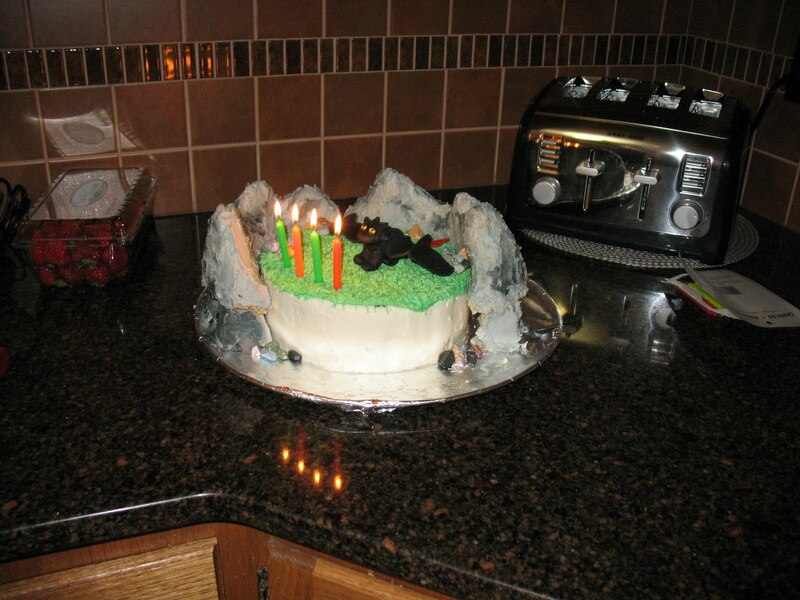 I mixed up some gray icing and put it on the mountains. The great thing about making mountains is they are not expected to be smooth, which makes decorating them super easy and fast! Sadly, my mountains were not tall enough but I didn't want to make another batch on Rice Krispie squares so I cheated and bought a box. Cut them all in half and put them around the base of the cake. I had to stack them 2 high to make the mountains as high as I wanted. Just stick them down with some icing and use some in between. 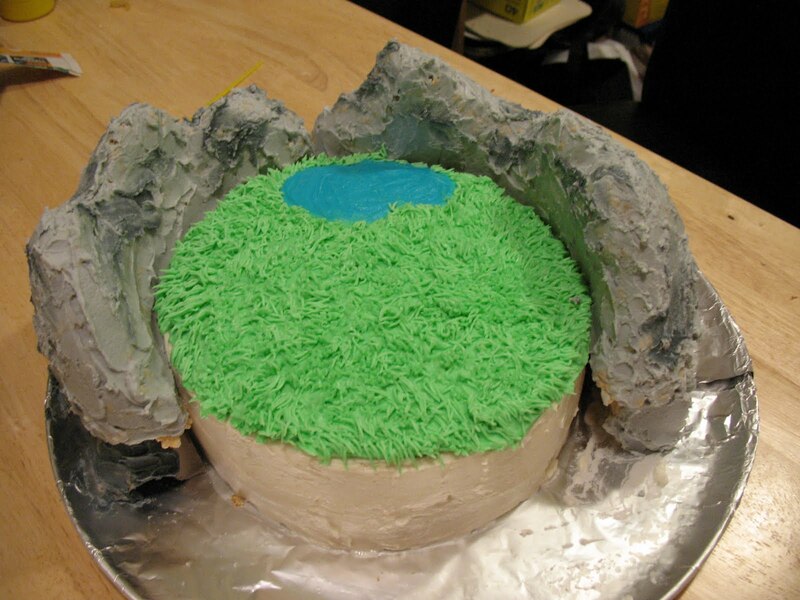 Then frost the outside edge and stick the mountains on top. I do have to admit, though, that I ran out of Rice Krispie squares but was too lazy to make more or go out and buy more, so I improvised. I cut up an egg carton and used that for part of the underneath parts. But it got the job done! And another little touch. Thanks, Mom, for telling me about these cool chocolate "rocks" at the Bulk Barn! you add the DRAGON and CANDLES!! It was a big hit! 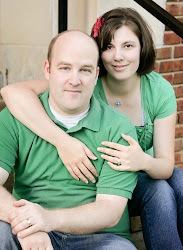 Happy Birthday, my sweet boy! How do you make the dragon?? You didn't say how! I didn't take photos of the process. After I had made it, I wished I had. I mixed fondant with gum paste (in black) and formed it like I would have with play doh or clay. Sorry, I know that's not much help.